The Harvard Law School Food Law and Policy Clinic (FLPC) is happy to welcome Alyssa Chan, who joins as Program Coordinator. Alyssa became involved with the Harvard Law School Food Law and Policy Clinic while still in undergrad. Beginning as a student in Emily’s Food Law and Policy course, Alyssa worked as an intern at FLPC in the summer of 2016 and as an RA the following fall. After graduation, she joined the clinic full-time as Program Coordinator in January 2017. As an intern and RA, Alyssa worked together with Fundacion Alternativas to prepare a policy brief on the relationship between infrastructure and food security in Bolivia, traveled to Navajo Nation to visit partners and promote farm-to-school programs, and contributed research to the farm bill consortium. She first became interested in sustainable food systems while working on an organic farm and winery in Argentina. Since then, her focus has shifted to food justice issues, including food access, labor in the food system, and equitable access to land and capital for socially disadvantaged farmers. In her current role, Alyssa splits her time between the farm bill research consortium and the food waste initiative. 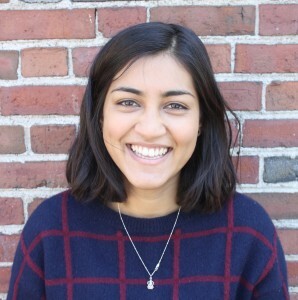 Alyssa graduated from Harvard College in December 2016 with a joint degree in Chemistry and Earth and Planetary Sciences, and a minor in the Comparative Study of Religion. 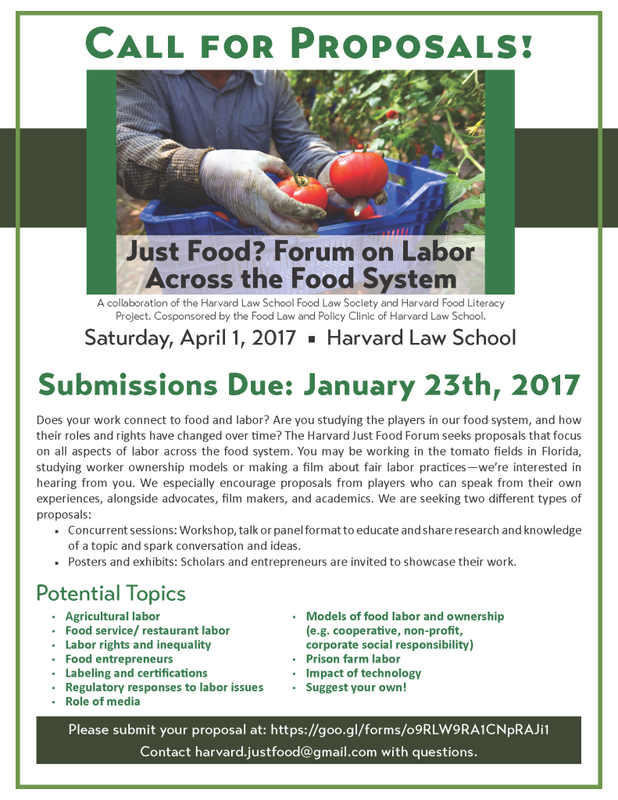 This blog post was written by Susanna Barron, a Student in 2016 Fall Semester of Harvard Law School’s Public Health Law and Policy Seminar. 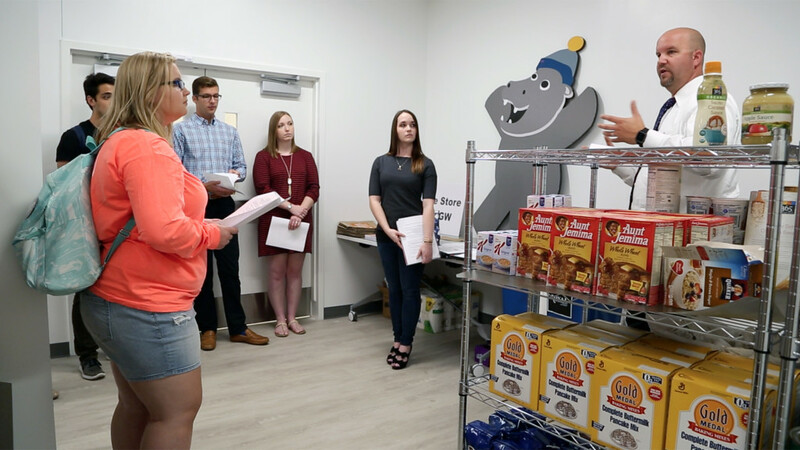 George Washington University students are introduced to the school’s food pantry, called “The Store.” Image still from Washington Post. As I was reading the assigned articles about SNAP benefits, particularly those focused on the political rhetoric that has typically surrounded discussion of these and other government benefits, linking use of these benefits to a lack of self-sufficiency or personal responsibility and stereotyping recipients as lazy and irresponsible, I was reminded of this NPR article I read last week about food insecurity among college students. Rising education costs were a major issue discussed during the election cycle, and increasing attention is being given to the unique challenges that first generation college students, often minorities and/or from immigrant families, may face, particularly those from low-income backgrounds, but this was the first time I had seen food insecurity addressed in this context. While I think food pantry programs on college campuses are admirable in their efforts to address the needs of students struggling to afford food while avoiding embarrassment and stigma as much as possible, I was surprised to learn that programs like this are even necessary, particularly at elite and well-funded institutions, many of whom are increasingly seeking to attract a more diverse student population. But a recent study showed that 48% of college students reported food insecurity in the previous 30 days, despite the fact that 56% of the students surveyed had paying jobs and ¾ of them were receiving financial aid. Rates of food insecurity were significantly higher among Black students (57%) and among first generation college students (59%). These numbers clearly highlight the need for schools and policymakers to address food insecurity among students in the context of broader efforts to address rising costs and improve equity in access to higher education. However, I think these numbers also provide an important and compelling counterpoint to the pervasive narrative of personal responsibility that has influenced policy on government benefits like SNAP and has been used to stigmatized those who use them. Low incidences of fraud and the facts that the majority of recipients use SNAP for a year or less, and 40% recipient household have at least some earnings[i] help to dispel the image of “welfare queens” who are unwilling to work and living indefinitely off government benefits, and in recent years even more conservative politicians have embraced SNAP as an efficient program to address poverty. Nonetheless, polls show that many Americans still believe that poor people “have it easy” because of their ability to rely on government benefits[ii], suggesting that the personal responsibility narrative remains very much alive in this country. When the average American thinks about people who are food insecure and reliant on government benefits as an important source of income, they are likely not thinking about college students, including those studying at prestigious and exclusive schools. The idea of the “American dream,” which is strongly rooted in notions of the importance of hard work and personal responsibility, has always highlighted education as an essential step to upward mobility and success. What does it say when people who work hard to pursue an education that is billed as the key to economic opportunity are struggling to buy food? While the solutions to this issue are unclear, to me this underscores the need for any meaningful effort to address poverty and food insecurity in this country has to involve a better understanding of just how pervasive these issues are, both in terms of the significant number of people affected, and in the diversity of their experiences. Concurrent sessions: Workshop, talk or panel format to educate and share research and knowledge of a topic and spark conversation and ideas. Posters and exhibits: Scholars and entrepreneurs are invited to showcase their work. Developing a more standardized system could keep 398,000 tons of food from being wasted every year, according to a report released this year by Harvard Food Law and Policy Clinic and other groups. The average family throws out about $1,500 in perfectly edible food a year, CBS News reported. “Dates On Food Labels May Actually Start To Make Some Sense,” published by The Huffington Post on December 21, 2016, reports on new guidance from the United States Department of Agriculture (USDA) which recommends that manufacturers use one easy-to-interpret label: “Best if used by.” The hope is that an easily understood, standardized label across all food products will cut down on consumer confusion and reduce the amount of edible food that becomes garbage. The USDA’s guidance calls on years of research from leading food law and policy organizations, including the Food Law and Policy Clinic of Harvard Law School (FLPC). FLPC has released a statement applauding the guidance and the call for streamlined expiration labels. Written by By Julie Steenhuysen and originally published by Reuters on January 5, 2017. Scientists have shown conclusively that treatment not only improves the health of people infected with HIV, it also stops transmission of the virus that causes AIDS. That public health issue is just one of the challenges Republicans face as they attempt to overhaul the Affordable Care Act, a law that brought health insurance coverage to some 20 million people – including tens of thousands of Americans living with HIV. Lawmakers are currently considering repealing the massive 2010 U.S. health reform law known as Obamacare as soon as this month. But the roadmap is tentative, and complicated: it would keep the Medicaid expansion and the new individual insurance plans in place and delay major changes for up to three years. This would give Republicans more time to craft a replacement plan, but it is not clear if individual insurance prices would skyrocket during the delay or what the new coverage will look like. HIV experts are among the groups, including insurers and hospitals, that have started lobbying lawmakers. They want to keep the current level of insurance coverage in place and say that even “repeal and delay” would disrupt care, put patients in jeopardy and increase the risk of transmission of a deadly communicable disease. Republicans will have the added worry of reducing coverage for an infectious disease that once represented certain death, but now can be controlled with daily medications that also keep the disease from spreading. In Illinois, one in three people with HIV gained coverage through Medicaid expansion or the new individual insurance plans created under the ACA, according to an analysis compiled for Reuters by the AIDS Foundation of Chicago. The number of HIV-positive individuals covered by Medicaid in Illinois rose by more than 50 percent between 2013 – the year before the new healthcare coverage went into place – and 2016, when 13,694 people with HIV were enrolled. HIV experts in Republican states have already been wrestling with the issue of caring for patients with HIV. Earlier this year, North Carolina became the 48th U.S. state to permit the use of federal grant money via the Ryan White HIV/AIDS program to pay insurance premiums for people with HIV. “We’re late to the party, and now the party may be over,” said Allison Rice, director of the Health Justice Clinic at Duke University School of Law in Durham. Insurers, including UnitedHealth Group (UNH.N) and Aetna (AET.N), pulled out of Obamacare exchanges for 2017. The plans are offered to everyone regardless of their health and cover everything from routine check-ups and emergency room visits to organ failure and cancer, and insurers said costs of doing that were higher than expected. Policy experts say the delay to an Obamacare replacement may give insurance companies little incentive to stick with the Obamacare individual insurance plans. Insurance companies have asked lawmakers to keep subsidies in place and make changes they hope will help stabilize the market, such as delaying deadlines for 2018 plan submissions. “It creates a really difficult environment for insurers to commit to the market,” said Carmel Shachar of the Center for Health Law & Policy Innovation at Harvard. Shachar co-wrote a letter signed by 174 national, state and local HIV organizations urging members of the senate not to repeal or modify the Affordable Care Act without a clearly defined replacement plan. That was followed by a letter on Tuesday sent by more than 950 HIV medical professionals urging Congressional members not to repeal the Affordable Care Act without a viable replacement plan, and to sustain the federal commitment to the Medicaid program. “In most states, prior to the ACA, low-income patients with HIV were denied Medicaid coverage until they became sick and disabled, and did not have the resources to participate in health savings accounts,” the group, which included the HIV Medicine Association, said in a statement. America’s Health Insurance Plans in December said an immediate repeal of federal support – particularly federal cost-sharing programs and Medicaid expansion – would jeopardize care for millions of Americans and disrupt market stability. Before the ACA was passed, only about 13 percent of people with HIV had private health insurance and 24 percent had no coverage at all, according to the Department of Health and Human Services. Medicaid, which provides insurance for low-income individuals, is the largest source of insurance coverage for people with HIV, covering more than 40 percent of HIV-positive individuals, Kaiser Family Foundation estimates. In the 31 states plus the District of Columbia that expanded Medicaid under ACA, the law eliminated rules that prevented all but pregnant women and the disabled from gaining coverage. “Obviously, not every state expanded Medicaid, but for the vast majority that did, this was the single most significant piece of the Affordable Care Act for people with HIV,” said Amy Killelea of the National Alliance of State & Territorial AIDS Directors (NASTAD). Another 25 percent of people with HIV are covered by Medicare, the U.S. insurance program for the elderly and permanently disabled. Nationwide data on how many of the 1.2 million HIV-positive individuals in the United States gained coverage through the ACA are still being tallied, said Kaiser health policy analyst Jennifer Kates. But policy experts say the impact has been dramatic. In non-expansion states, many people with HIV got their insurance premiums for Obamacare plans paid through the Ryan White program, a federal grant program established after the death of the Indiana teen in 1990 of AIDS. The program funds AIDS Drug Assistance Programs (ADAP), which pay for AIDS drugs and insurance premiums for people who are uninsured and underinsured. “It’s the main safety net below Medicaid, below Medicare, below private insurance,” Kates said. Even if the Affordable Care Act were repealed in full, Ryan White would be there as a safety net, but the program has a fixed budget each year. In the past, that has resulted in waiting lists. In September of 2011, nearly 9,300 people were on ADAP waiting lists nationwide, NASTAD data show.